The U.S. Army Marksmanship Unit (USAMU) regulary publishes “how-to” articles on the USAMU Facebook page. 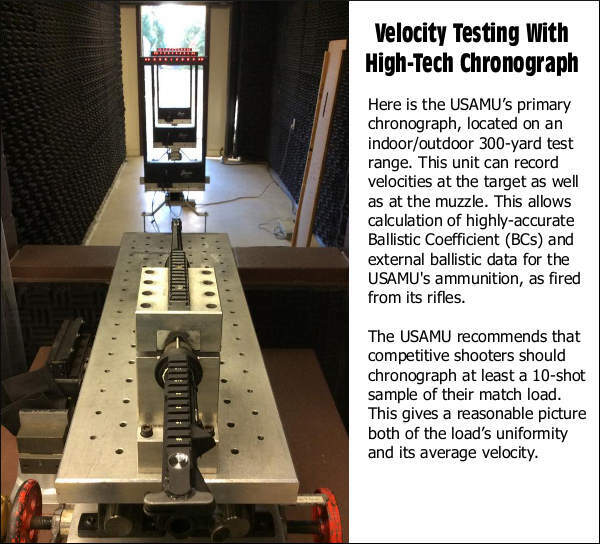 One informative “Handloading Hump Day” article covers chronograph testing and statistical samples. We highly recommend you read this article, which offers some important tips that can benefit any hand-loader. Visit the USAMU Facebook page next Wednesday for the next installment. Share the post "Chronos by The Numbers — Tips on ES, SD, and Sample Sizes"
Over the past 12 months, this article was one of the TOP TEN most-read Daily Bulletin features. We’re reprising it today for those who may have missed it the first time. 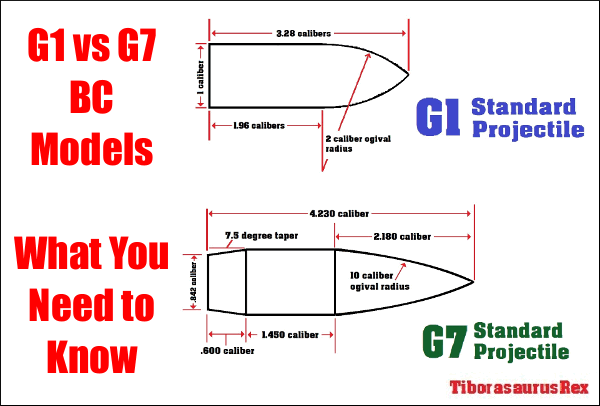 The above diagram comes from a TiborasurasRex YouTube Video comparing G1 and G7 BC models. CLICK HERE to watch the video. The better, up-to-date ballistics programs let you select either G1 or G7 Ballistic Coefficient (BC) values when calculating a trajectory. The ballistic coefficient (BC) of a body is a measure of its ability to overcome air resistance in flight. You’ve probably seen that G7 values are numerically lower than G1 values for the same bullet (typically). But that doesn’t mean you should select a G1 value simply because it is higher. The simple answer is the G1 value normally works better for shorter flat-based bullets, while the G7 value should work better for longer, boat-tailed bullets. G1 vs. G7 Ballistic Coefficients — Which Is Right for You? G1 and G7 refer both refer to aerodynamic drag models based on particular “standard projectile” shapes. The G1 shape looks like a flat-based bullet. The G7 shape is quite different, and better approximates the geometry of a modern long-range bullet. So, when choosing your drag model, G1 is preferrable for flat-based bullets, while G7 is ordinarily a “better fit” for longer, boat-tailed bullets. The reason the BC for the JLK is less is mostly because the meplat was significantly larger on the particular lot that I tested (0.075″ vs 0.059″; see attached drawings). For bullets like these, it’s much better to use the G7 standard. The following BCs are referenced to the G7 standard, and are constant for all speeds. Many modern ballistics programs, including the free online JBM Ballistics Program, are able to use BCs referenced to G7 standards. When available, these BCs are more appropriate for long range bullets, according to Bryan. Share the post "G1 vs. G7 Ballistic Coefficient Models — What You Need to Know"
How good is .22 LR rimfire ammo you just bought? Well, until now, you had to just cross your fingers and do your own testing (unless you could make the journey to the Eley or Lapua test centers). Now that’s changed. In a matter of seconds, you can access tons of test data for Eley rimfire ammo, seeing how any given lot has performed, and how consistent it has proven. You can view a wealth of data, including group size, percentage of shots within tenths of inches from center, velocity and more. There’s even a 50-shot consolidated group display that conveniently reveals large sample accuracy in a glance. With ELEY’s new web-based Lot Analyzer, you can easily compare various lot numbers, choosing the one that shows the best test results. 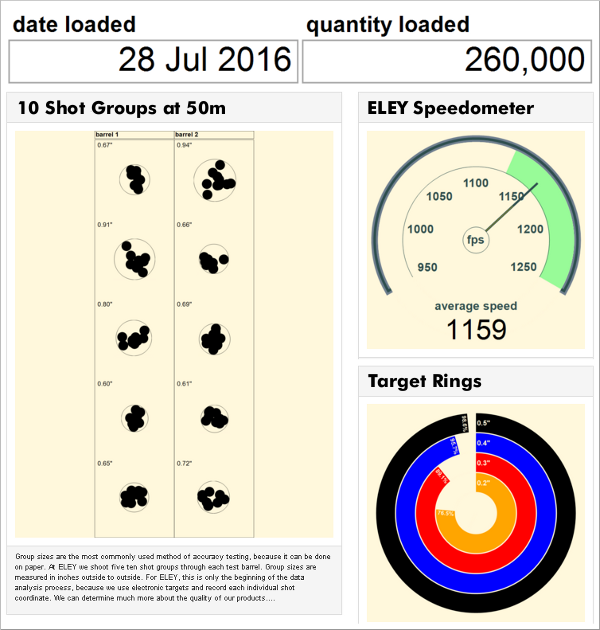 With the ELEY Lot Analyzer, simply enter any ELEY lot number into the online database. You’ll then see a heap of information including 10-Shot Groups, 50-Shot Groups, Average Velocity, Ballistics Coefficient, Shot Distribution graphs, and even the Eley Coin Test — the percentage of this lot capable of hitting a dime at 54.7 yards (50m). We believe the ELEY Lot Analyzer delivers the most comprehensive lot-specific ammo performance information ever provided by any ammunition manufacturer. To see how the ELEY Lot Analyzer works first-hand, CLICK HERE and enter this lot number 1016-02107 (be sure to include the dash). We think the ELEY Lot Analzyer is great for the consumer. It is now possible to select a box of ammo from a store shelf, enter the ELEY lot number, and instantly see the performance of the ammunition. 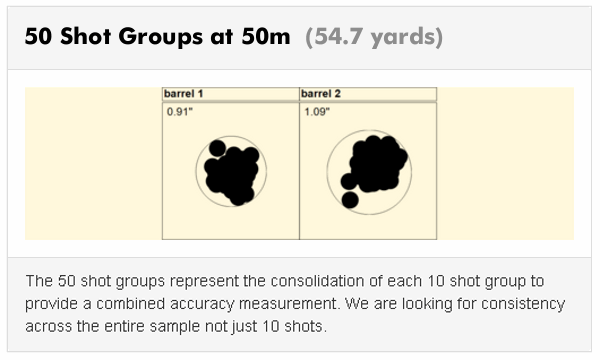 Get together with fellow shooters and compare your ELEY ammo. This service will be available for all ELEY lot numbers in the USA from 2015 forward. You can find the year of your ammunition by the third and fourth numbers in the lot. For example, if your lot number is 3016-30xxx, it is from the year 2016. Our staff has tested rimfire ammo in both the ELEY and Lapua Test Centers, and then shot that same ammo later in competition at outdoor ranges. We learned something in the process. First, ammo can do well in a test tunnel, with a clamped test fixture, yet perform very differently outdoors on a real range. Likewise, ammo may shoot superbly in one rifle, yet perform so-so in another rifle, even when the barrels are from the same manufacturer. 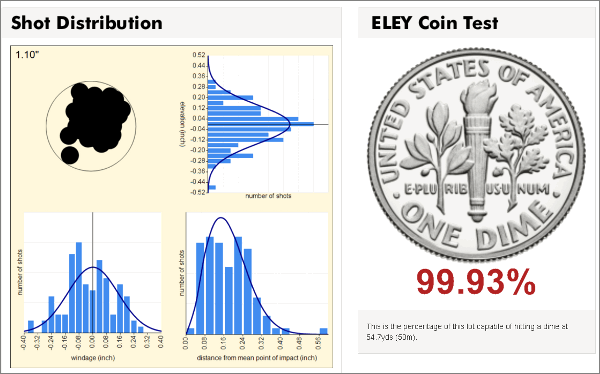 We commend ELEY for providing the Lot Analyzer — this really does offer invaluable information to the consumer. This represents a big step forward. That said, you need to understand that factory test results cannot necessarily be duplicated in the real world. 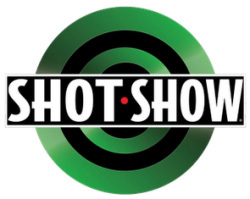 And we can confirm that some ammo which was less than stellar in the test tunnel actually shot superbly in real rimfire benchrest competition. LESSON: Even with the ELEY Lot Analyzer, you still need to do your own testing, with your own rifle, to verify .22 LR ammo performance. 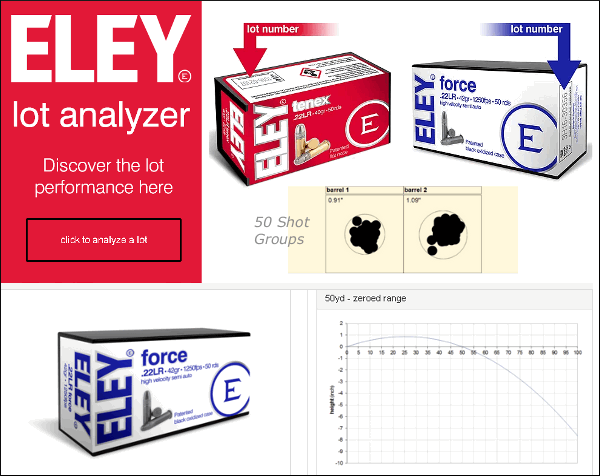 Share the post ".22 LR Ammo Performance — ELEY Offers Online Lot Analyzer"
Berger has released two important informational updates for its line-up of bullets. First, the Ballistics Coefficients (BCs) have been updated for the vast majority of bullets Berger sells. In addition, G7 model BCs are being provided for most of the bullets. You will want to use the updated BC data, which is based on actual testing of recent production lots of bullets. Second, Berger is now providing a dual twist-rate recommendation for most bullets. Berger is now lists a “minimum” barrel twist rate as well as an “optimal” twist rate. To get maximum long-range performance from your bullets, use a barrel with the “optimal” rate of twist. Berger notes: “We have updated all of our Ballistic Coefficients to be even more accurate. Prior to 2008, all of Berger Bullets’ BCs were calculated using a computer prediction. Early in 2009, we began measuring BCs with live-fire testing. As a result, Berger’s BCs were updated and G7 BCs were also made available. This represented a dramatic improvement in the accuracy of performance data at that time. Since 2009, the BCs assessed for Berger Bullets have not been updated. As part of our ongoing effort to provide shooters with the best information possible, Berger has been testing every lot of bullets produced for the last several years. The result is updated and highly accurate running averages of BCs for recent production lots. Berger also added the G7 form factor to the Ballistics Quick Reference Sheet. The analysis of form factors can be very useful when considering a bullet’s long range performance potential. Going by BC alone can be deceptive since BC includes the weight and caliber of the bullet. Form factor indicates how much drag the bullet has, which is a very important consideration for all bullets of all calibers. Recommended twist rates for bullets are commonly listed as a single value, such as 1:12” (one rotation in 12″ of barrel travel). This may be overly simplistic. There is a big gray area of marginal stability in which bullets can fly with good accuracy, but with a reduced (i.e. sub-optimal) Ballistic Coefficient. Recognizing this reality, Berger is now listing two twist rates for each bullet it makes. The first is the minimum twist needed for good accuracy, which Berger has always recommended. The second is the new optimal twist rate, which is the twist that will stabilize the bullet to a level which achieves its full performance (BC) potential. CLICK HERE For more information. Share the post "Berger Updates Bullet BC Data and Recommended Twist Rates"
The simple answer to that is the G1 value normally works better for shorter flat-based bullets, while the G7 value should work better for longer, boat-tailed bullets. Share the post "Coefficient Conundrum: G1 vs. G7, Which BC Should You Use"
Following Sierra’s introduction of Tipped MatchKing (TMK) bullets, Bryan Litz of Applied Ballistics LLC has received many requests to determine the Ballistic Coefficient (BC) of these bullets through testing. Below are Litz’s findings for four out of the six bullets he has able to acquire and test so far. Share the post "Litz Field-Tests BCs of Sierra Tipped MatchKings"
Sierra has announced a new line of plastic-tipped MatchKing bullets. “Say What!? — that can’t be right…” you may be thinking. MatchKings have always been jacketed, hollowpoint bullets. Until now, plastic tips have been reserved for other Sierra projectiles, such as BlitzKing varmint bullets. 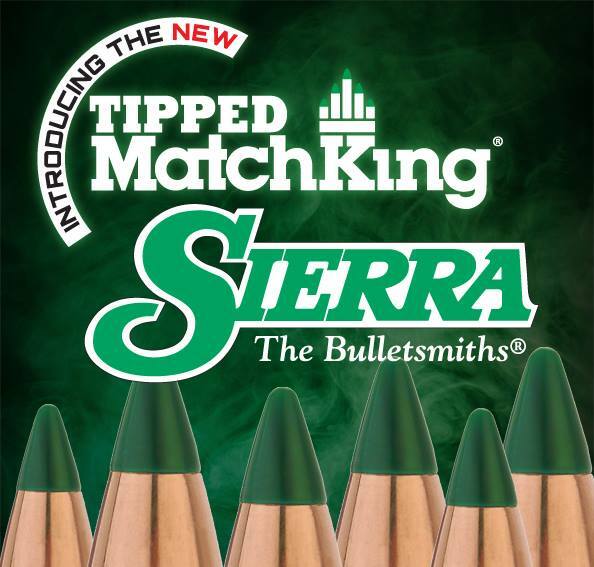 But that is changing with the introduction of Sierra’s line of Tipped MatchKing (TMK) bullets featuring green acetal resin tips. There will be six (6) new TMK bullets, two in .224 caliber, and four in .308 caliber. The six new tipped bullet types should be available in “early 2015″. Sorry, Sierra will not be offering 6mm, 6.5mm, or 7mm TMKs for the time being, although Sierra will introduce more TMK varieties in the future. Currently, Sierra is focusing on “the most popular calibers”. Notably, the new 22-Cal 77gr TMK has a 0.420 BC — identical to the BC of Sierra’s 80gr non-tipped HPBT MatchKing. So, you get the BC of a heavier bullet in a lighter projectile that can be pushed faster. That’s big news for .223 Rem and 22-250 shooters. Share the post "NEW Tipped MatchKing (TMK) Bullets from Sierra"
Lapua has done extensive field testing of its bullets, using sophisticated Doppler radar equipment. Employing radar, Lapua has logged actual observed trajectories with a variety of bullet and cartridge types. And Lapua has just released updated radar data for Scenar-L bullets used with 6.5×47 Lapua, 6.5×55 Swede, and .308 Winchester chamberings. You’ll find this new data incorporated into Lapua’s product description tables for these three cartridge types. You will also find both G1 and G7 BCs for the new line of Scenar-L Bullets in Lapua’s updated Components Table. 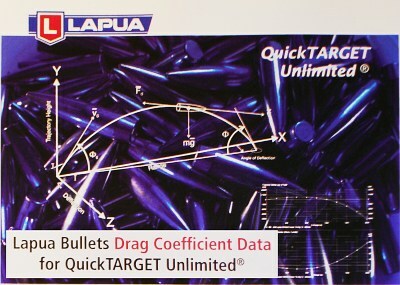 Ballistic coefficients are based on Doppler radar data and calculated by Quick Target Unlimited Lapua Edition. To find the BC for a particular bullet, go to the Components Table, select the caliber (on the left) and then look for the G1 or G7 value on the right for particular bullets. For example, the BCs for the new 136gr 6.5mm Scenar-L are 0.545 (G1) and 0.274 (G7). If you are looking for the most precise trajectory predictions, nothing beats real-world testing like this. Bullet BCs can be calculated, “on paper”, from bullet size, weight, and shape. However, in the ‘real world’ the actual aerodynamic drag forces acting on the bullet change with velocity and other variables. Therefore, a bullet’s BC is NOT actually constant at every point in its flight path. Doppler radar allows Lapua to observe the actual drop of bullets at multiple points along their trajectory. How much more precise are Doppler-radar-based trajectory predictions than typical drop charts based on modeled BCs? Consider this… when you plug the radar-based numbers for a .338 Lapua Magnum into Lapua’s ballistics software, the error in elevation is less than 2.5 cm (1″) at 1,500 meters. By contrast, the error based on a traditional G1 BC model could be over 1 meter (i.e. more than 40 inches). If you want to use Lapua’s Doppler Radar data for your own ballistics calculations — there’s a App for that. 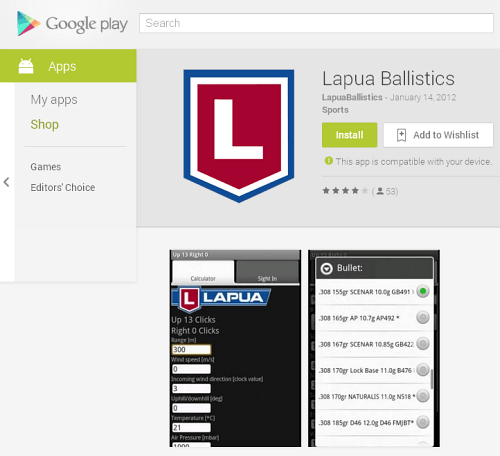 Lapua’s Quick Target Unlimited (QTU) software for Android OS can be downloaded for free from the Android Market. 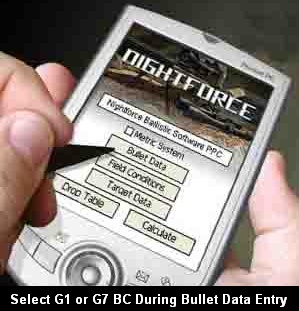 Predicted trajectories for this software are based on precise Doppler radar ballistic measurements of Lapua bullets, making this program much more accurate than other ballistic programs for mobile phones. Note, however, the Doppler Radar data is offered ONLY for Lapua-made bullets. This App does NOT include radar data for Berger, Sierra or other brands of bullets. 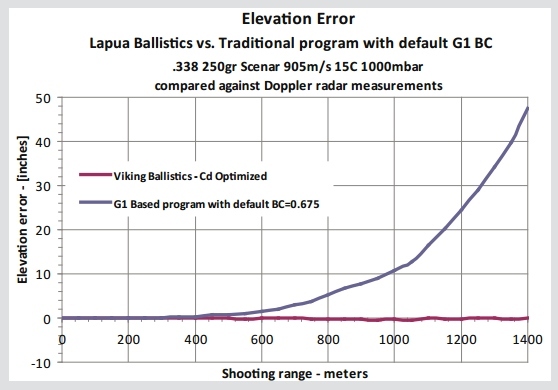 Share the post "Lapua Releases Doppler Radar Data for Lapua Scenar-L Bullets"
Share the post "G1 vs. G7 Ballistic Coefficients — What You Need to Know"
SHOT Show 2013 kicks off in two weeks in Las Vegas. One of our top priorities is to talk with the bullet makers from Berger, Hornady, Lapua, and Nosler. At SHOT Show 2012 we chatted with Berger Ballistician Bryan Litz about Berger’s popular line of Hybrid bullets. Berger now offers a wide range of Hybrids in multiple calibers and weights. In fact, for .30-Caliber shooters, Berger now offers six different Hybrid match bullets, with weights from 155 grains up to 230 grains. New .338 Cal Tactical Hybrids were released in 2012 and big .375 Cal, and .408 Cal Hybrids are in the works (read more below). For those not familiar with Hybrid bullets, the Hybrid design blends two common bullet nose shapes on the front section of the bullet (from the tip to the start of the bearing surface). Most of the curved section of the bullet has a Secant (VLD-style) ogive for low drag. This then blends in a Tangent-style ogive curve further back, where the bullet first contacts the rifling. The Tangent section makes seating depth less critical to accuracy, so the Hybrid bullet can shoot well through a range of seating depths, even though it has a very high Ballistic Coefficient (BC). In the video we asked Bryan for recommended seating depths for 7mm and .30-Caliber Hybrid bullets. 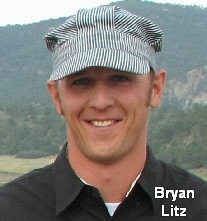 Bryan advises that, as a starting point, Hybrid bullets be seated .015″ (fifteen thousandths) off the lands in most barrels. Watch the video for more tips how to optimize your loads with Hybrid bullets. In related news, Berger announced that it will be offering a series of .338-caliber Hybrids. First Berger is reintroducing the Gen 1 .338 Cal, 300gr Hybrid bullet in Berger’s Hunting line. Berger will also be making a 250gr Hybrid Hunting bullet using the same type of jacket as the original Gen 1 300gr Hybrid bullet. In addition, Berger has released a .338 Cal 250gr Match Hybrid OTM Tactical bullet, along with a 300gr Match Hybrid OTM Tactical projectile. More big bullets are on the drawing board. Our source says “.375 Caliber and then .408 Caliber are the next new calibers to be made at Berger”. These are in the design phase, and Berger needs to build a new machine, so the .375s and .408s will not be available until 2013 at the earliest. 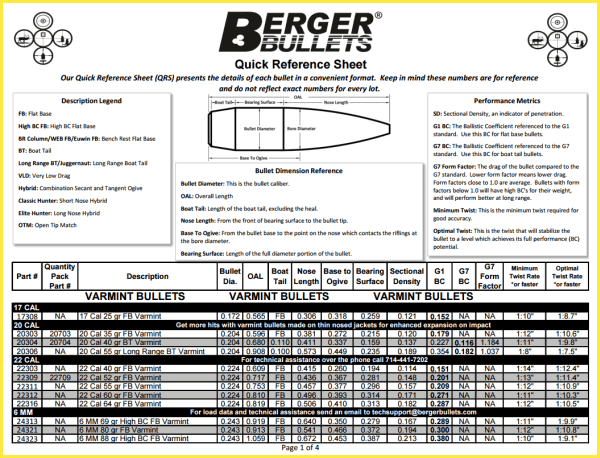 Share the post "Berger Hybrid Bullets — What You Need to Know"